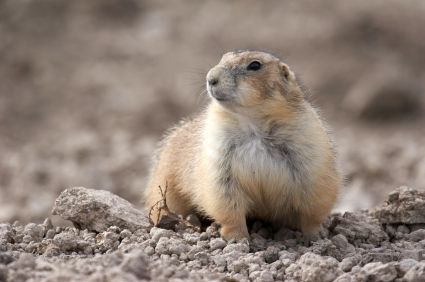 Meet our featured animal, the black-tailed prairie dog! Prairie dogs live in small, close-knit families called coteries. Groups of neighboring coteries form a prairie dog colony. Prairie dogs communicate with each other through barking. They can describe a predator by varying the frequency and pitch of their barks. Prairie dogs perform jump-yip calls, in which they stand on the mound, throw their head back, and let out a high-pitched bark, sometimes evening toppling onto their backs due to the exertion. Although they once numbered in the hundreds of millions, prairie dog populations are now estimated at around 10-20 million. Prairie dogs are very social animals. In order to survive the predators of the plains, prairie dogs have a system of calls to alert members of the colony of danger. Professor Con Slobodchikoff of Northern Arizona University has spent the last 30 years delving deep into the nuances of prairie dog communication. In his research, he performed a series of experiments recording the prairie dog sounds when certain predators entered the scene. What he found was surprising. Prairie dogs use different frequencies and pitches to not only distinguish a hawk, a coyote, a dog, or a human, they also describe the predator specifically. For example, prairie dogs distinguish a fat, short human from a skinny, tall human. Interestingly, they do not discern male versus female humans, however. You can hear the different prairie dog calls in an interactive graphic at NPR.org. 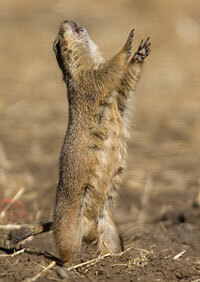 To learn more about prairie dogs, see Animal Fact Guide’s article: Black-tailed Prairie Dog.